There are many who will or should engage in some soul-searching, following the U.S election, in which for the first time in the country's history, someone came from no background in public office or military command and seized control of a major political party, running against all those who had led it for the last 20 years, then defeated the incumbent party, defeating all the Clintons, Bushes and Obamas together. The Clintons and Bushes and Obamas are finally finished. Their entire era, though it had its moments, has been a worsening disaster as the United States has been in absolute and relative decline. The media have been exposed in their biases, their overwhelming hostility to Donald Trump, as not just irrelevant, but the object of hatred as intense as that which overwhelmed the political elites who failed the nation and imperilled the alliance America founded and led for many decades. The public's loathing and distrust of the media is richly deserved and indicative of one of Western society's greatest failings: the free press has failed. Only the fact that there is no alternative keeps it going. Few people now pay much attention to the common misrepresentation of public issues and people; nor should they. The American media turned itself inside out trying to portray Trump as a misogynist, a racist and an authoritarian populist whipping up mobs and inciting violence. All this was unmitigated rubbish. 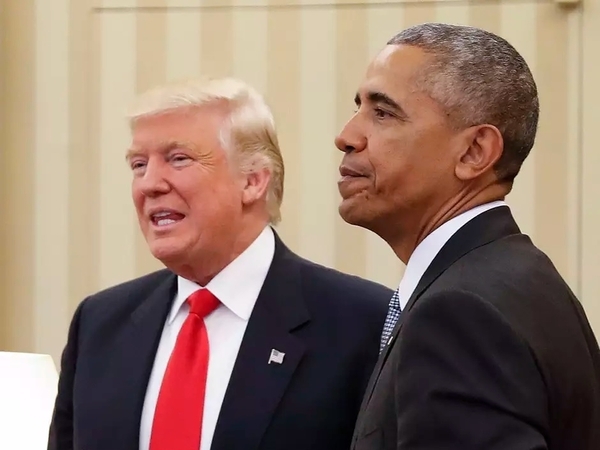 President Barack Obama strutted about the campaign trail in a last-ditch effort to salvage the Clinton campaign (despite the notorious absence of any affection between the Obamas and the Clintons), and accused Trump of being a sympathizer of the Ku Klux Klan. The president would have his listeners believe that Trump, who has an unblemished record as an equal opportunity employer, approves of thugs surging about in hoods and bedsheets, burning crosses on the lawns of African-Americans, Jews and Roman Catholics (most of whose 30 million voters cast their ballots for Trump). The media screamed for Trump's blood when the Clinton campaign released an 11-year-old tape of boorish remarks about women, though what Trump said was the bland and pious reflection of a Baptist minister compared to the normal conversation of Lyndon Johnson, or the actual conduct, while discharging presidential business, of Bill Clinton. It was magnificent watching the Clinton News Network (CNN) robots on autocue scurrying around like asphyxiated roaches as it became clear that Trump would do the impossible and win, and that the public saw through the animosity of the lazy, complacent, boot-licking, myth-making claque of the Washington media, with its liars, defamers, frauds and idiots. Last Sunday, I was a token expositor of a positive view of Trump, though I am no Clinton-basher, on Fareed Zakaria's television program GPS. Fareed, a pleasant and capable man and a friend of many years, opened with a frenzied recitation of Trump's status as a sexist, racist, xenophobic and crooked demagogue. What followed for 45 minutes, apart from Zbigniew Brzezinski's artful debunking of the Obama foreign policy ("engaged but ineffectual"), was a sequence of Clinton-parrots. There was a debate between two pollsters about the breadth of Hillary Clinton's almost inevitable margin of victory. I politely demurred from all this when my turn came after 50 minutes, and Fareed has generously invited me back this Sunday. But his program wasn't fair comment or thoughtful information: it was propaganda, less virulent and hateful, certainly, than that of infamous promoters of the big lie in totalitarian states, but almost as lacking in integrity or balance. "We were all tacitly or explicitly #With Her.... Had Hillary Clinton won, there'd be a winking 'we did it' feeling in the press — we were brave and saved the republic.... Trump knew what he was doing when he invited his crowds to jeer and hiss reporters covering him. They hate us. And can you blame them? Journalists love mocking Trump supporters.... We diagnose them as racists in the way Dark Age clerics confused medical problems with demonic possession. Journalists at our worst, see ourselves as a priestly caste, we believe we have access to a greater truth." Instead of humility, Rahn expects the media to be confirmed in their view that Trump and his followers are racist and sexist, "so there must be more racists and sexists than we believed." Even Rahn's mother, the saintly Peggy Noonan, while saluting Trump's victory and acknowledging the general failure to appreciate the depths of public anger, called upon the country to "help him" because he doesn't know how to be president. As long as the president does not seriously violate the Constitution, the presidency fits its occupant, not the other way round. George VI stammered something to president Franklin D. Roosevelt when he visited in 1939, and said, "This Goddam stutter!" and Roosevelt said, "What stutter? You are the King and you speak as you speak. I could say 'this Goddam polio,' but our peoples support us because we hold our positions legitimately and do our jobs adequately, and having shortcomings themselves, aren't overly concerned with ours." Trump will build on his elegant remarks on election night, and can rally the vast centre of American opinion with a tasteful and magnanimous demeanour and the recruitment of competent people who reflect the diversity of America. He has a clear mandate to reform Obamacare, reform the tax system to provide lower rates for the working and middle classes and less of a free ride for the financial industry, to shrink government, reduce the trade deficit, use workfare programs to reduce unemployment and modernize infrastructure, create a southern border, escalate counter-terrorism, reinvigorate the Western alliance and redefine national security between the trigger-happy interventionism of George W. Bush and the Obama attempt to exchange its friends for its enemies, especially in the Middle East. All this will get him off to a good start, keep faith with the believers and debrief the brainwashed skeptics, but will leave three vast problems. Standards of information and education have withered. The American people, and most other advanced nationalities, are less well-educated and less well-informed than they were 50 years ago. The teaching and academic professions and the journalists have failed. They have not failed completely, of course, and there are many individual exceptions, but they do not get a passing grade. Government can do something about the schools but can't really touch academia or the free press without threatening the foundation of free society. There is no obvious solution. The legal profession is increasingly a cartel in which lawyers as legislators and regulators spew out endless reams of new statutes and rules requiring an ever larger number of lawyers to argue, judge and arbitrate them. Legal costs to society are more egregious and less excusable than medical costs, and produce far less desirable results. The criminal justice system is an unspeakable cesspool. Here government can do something. Technological progress tends to create unemployment rather than jobs, as life becomes more automatable. This trend is parallel to the pattern of companies like Google, with few employees but immense market capitalization, leaving traditional manufacturers like automakers with the reverse phenomenon: a large number of employees sustained by less well-capitalized companies. No one that I have encountered has any idea about what to do about the trend toward industrial disemployment and the extreme disparities in income that it generates. Trump will promote rising employment and reduce the shrinkage of the workforce. But it is a long and winding upward trail back to a contented America, and to some extent, all advanced democracies are on the same trail.